A pervasive myth in Australia is that hot weather is the greatest danger to our health. In reality, it’s more likely cold weather will kill you. For all our concern about the dangers of heatwaves, simple analysis of mortality data suggests the cold months present a much greater health risk. Almost 7% of deaths in Australia from 1988 to 2009 were attributable to cold weather. Less than 1% of deaths were attributable to heat. Relating simple monthly mortality rates with temperature data for South Australia, we also see a clear and significant relationship between excess deaths and monthly mean temperature. The compelling graph below suggests that, rather than focusing our attention on heatwaves in summer, we should be far more worried about keeping people warm in winter. Australia may well be a sunburnt country, but even though most us live in parts of the nation with a mild climate, an increasing pool of empirical and anecdotal evidence suggests our houses are some of the coldest in the world. While clearly not the only contributing factor to high wintertime mortality and ill-health, housing is an important place to start. After all, Australians spend up to 90% of their lives indoors. Why do Australians suffer cold houses? Australian houses are mainly designed to keep us cool in summer rather than warm in winter, so are often hard (or costly) to heat. Thus the quality of housing that people are able to access is critical in shaping their exposure to or protection from cold conditions. The dominant heat narrative running through public health awareness campaigns and an overwhelming research focus on keeping houses cool continually reinforce the collective perception of Australia as a summer country. Keeping warm in winter has become an afterthought, an exercise in resilience. However, many Australian climates have more heating degree days than cooling degree days, so it takes more energy to make our houses comfortable in winter than in summer. Australian housing is built to relatively poor minimum thermal performance standards. These provisions, once considered progressive, have not been significantly enhanced for the past decade. One report suggests the standards are unlikely to be meaningfully revised until 2022 at the earliest. And once housing is built, there are no mandatory compliance checks for quality, insulation or warmth in either the owner-occupier or rental sectors. Fuel poverty is adding to the cost-of-living pressures on Australian households. For some, the cost of adequately heating draughty and poorly insulated homes is too high. A recent report suggests the number of Australians experiencing energy poverty is likely to be much higher than the 3 million living below the poverty line. Partly due to the above, we lack reliable, systematic and publicly available data about cold houses in Australia. This makes it difficult to track and make visible the extent of the problem. Realistically, most of us can do something about cold houses. We can, for example, spend more on power, fit solar panels, install insulation, or buy (or rent) well-designed warm houses. For people who are unable to take these steps, the cold house phenomenon bites hard. It may be because their houses are not designed to stay warm in winter and they cannot afford improvements. They may be in a rental tenancy where the landlord is unwilling to complete upgrades, or heating costs may just be too high. Whatever the reason, exposure to cold living environments has a well-documented range of health effects. These include cardiovascular disease, respiratory illness and communicable diseases. Importantly, it’s often the people most vulnerable to these health effects who live in cold housing – the elderly and people with existing health conditions. What is our research finding? Preliminary findings from a study of cold houses in Adelaide this winter support the points above. The participants we interviewed experience cold housing for a wide range of reasons. For some, the cost of energy was broadly affordable, but the poor dwelling design meant heating had to be run all or most of the time. 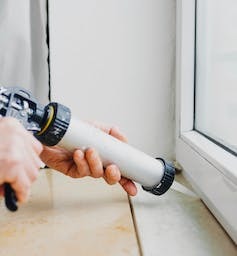 Once heating was turned off, draughts from badly sealed windows and doors, or lack of insulation in the walls and roof caused rooms to cool down quickly. For others, the fear of a big energy bill stopped them using heating at all. They made do with whatever was available to them, such as extra layers of clothing and blankets. These participants often had the worst housing, with no north-facing windows to make the most of any sunshine, no insulation, poor building sealing, inefficient heating and no foreseeable opportunity to improve the dwelling. The poorest and the most unwell of our participants were keenly aware of the health effects of their cold houses, suggesting that “every illness is worse” in the cold. What can be done about cold housing? Develop the capacity to identify the people who are affected by cold housing. Though this likely touches many different households nationally, special targeted assistance to people who are especially vulnerable to cold housing or its health effects has a clear social justice justification. This assistance would be similar to the UK’s winter fuel payments. Focus on making both new houses (with performance standards) and old houses (with retrofit schemes) better able to stay warm without over-reliance on heating. Establish ways to reduce broader fuel poverty. This requires strong national leadership and large-scale policy responses that relieve the pressure of high energy costs for our most vulnerable. This may take the form of targeted energy concessions, standardising of consumer power contracts, or welfare-focused bulk energy purchasing schemes. In the absence of reliable methods to measure the problem, we need to produce evidence and generate a national discussion. But the first step is breaking the myth of heat in Australia. Acknowledging that cold is a more pressing problem than heat forces us to look differently at building performance standards, underpins the need for design responses that are warm in winter as well as cool in summer, and focuses our attention on vulnerable Australians who need help to make their houses affordably warm. By Lyrian Daniel, ARC Research Associate, School of Architecture and Built Environment, University of Adelaide< and Emma Baker, Associate Professor, School of Architecture and Built Environment, University of Adelaide. This article was originally published on The Conversation. Read the original article.